Piazza del Campidoglio on Capitoline Hill. 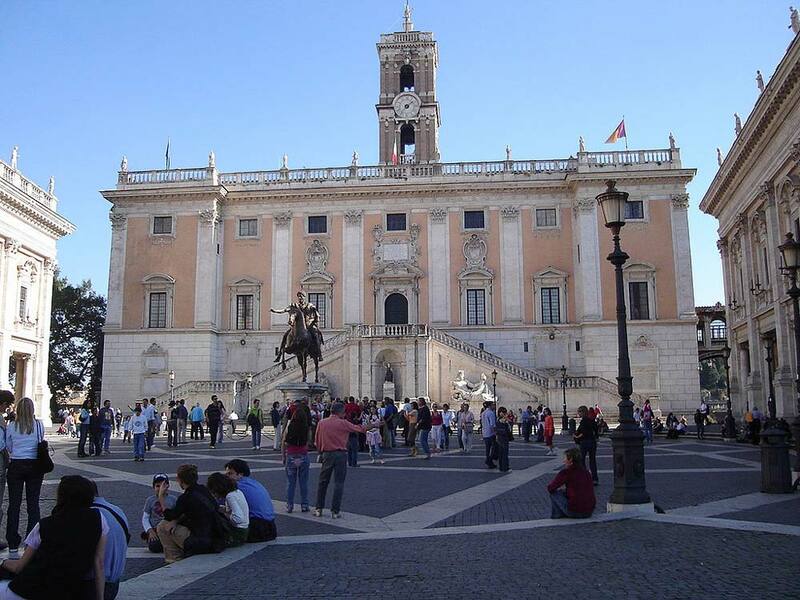 The Capitoline Hill is the smallest of the seven hills on which Rome stands. From the earliest days of the ancient city, it formed the center of Rome’s political and religious activity. It also represented the Roman view that the city was the capital of the known world. Little of its classical grandeur now survives at ground level because of medieval and early modern development. The most notable feature of the hill today is the large piazza by Michaelangelo. Some of the most important early temples were built in the area in the sixth century BC. These included the Temple of Jupiter, which was of great significance and was only a little smaller than the Athenian Parthenon. Other temples, dedicated to Virtus and Juno Moneta, were added later. The Tabularium, which served as the central archive of the empire, was constructed in 79 BC. In medieval times the area was used for a number of functions relating to city governance and palaces were constructed. However, the surrounding area was largely neglected. By 1536, when Holy Roman Emperor Charles V announced his intention to visit the city, it had become a muddy mess. Pope Paul III therefore requested that a new square be built by Michaelangelo, and this became the Piazza del Campidoglio. The design that Michaelangelo devised included the restoration of the Roman Senate house, as well as giving the Palazzo dei Conservatori a completely new facade. On top of this, the Palazzo Nuovo was built from scratch, while a vast staircase was intended to link the new piazza to the bottom of the hill. Construction began in 1546, but proceeded so slowly that the staircase was all that had been completed by the time of Michaelangelo’s death in 1564. The bulk of his designs were eventually implemented during the following century. The staircase itself was named the Cordonata. At its foot are statues of granite, depicting Egyptian lions. At the head of the staircase is a pair of statues in the classical style, showing the twins Castor and Pollux. The piazza’s center holds a sculpture of Marcus Aurelius riding a horse, although this is a replica. The original is still in existence, but is now on display in the Capitoline Museum nearby. The Palazzo dei Conservatori stands on the other side of the square. This was the center of civic government in medieval times. It is now also a museum that focuses on paintings and statues. In between the two is the Palazzo Senatorio, where the Senate sat until 1870. This building dates back to the 11th century, although it underwent two substantial sets of reconstruction in later medieval times. Today’s structure is only slightly altered from the building designed by Michaelangelo.